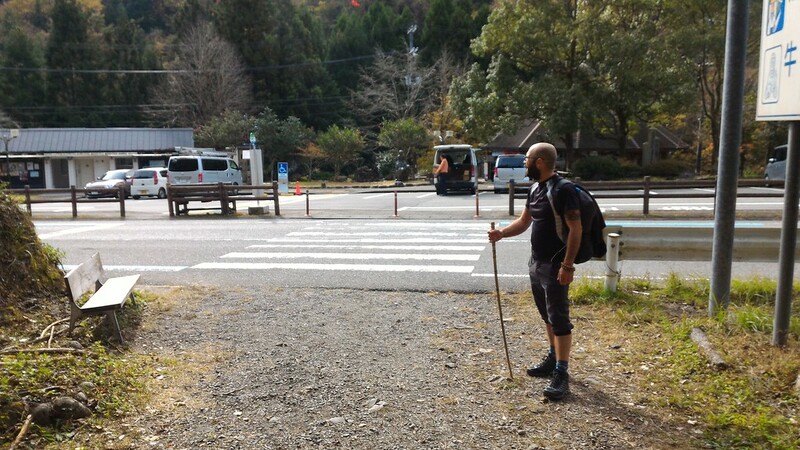 The Kumano Kodo is an ancient pilgrimage trail in the mountains of Wakayama (south of Kyoto) where you can walk with a light pack from guesthouse to guesthouse for a few days. 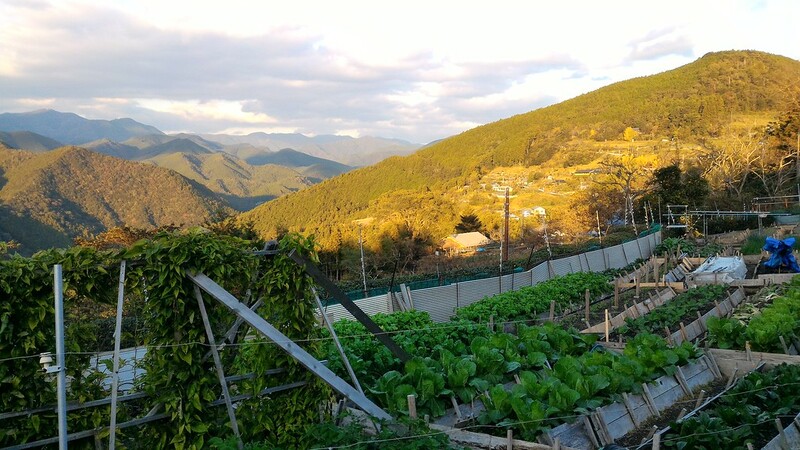 It’s a brilliant way to experience Japan’s rural side and ancient religious traditions. 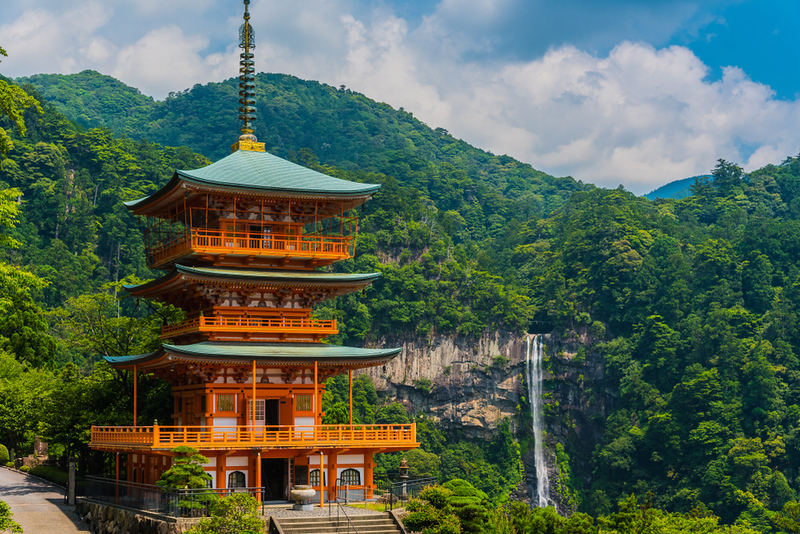 If you’re looking to do a trek in Japan, you’re probably considering either the Kumano Kodo, which is in Wakayama (southern Kansai), or the Nakasendo, which connects Tokyo and Kyoto via the mountains of Central Honshu. 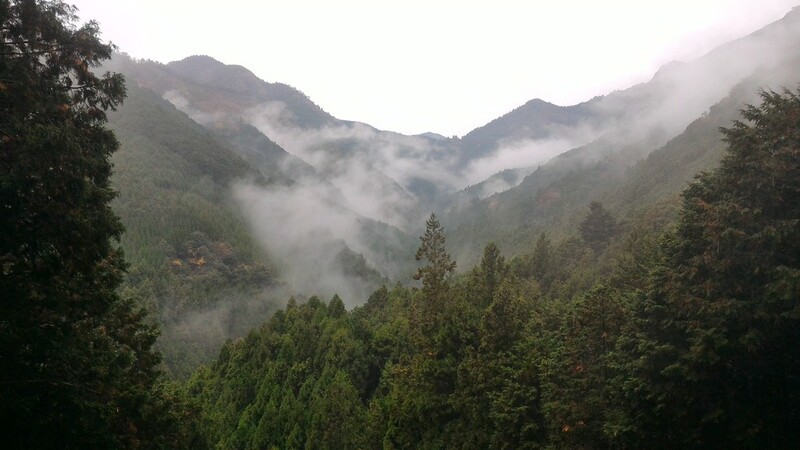 Since the Nakasendo has become popular in recent years, we find that the Kumano Kodo gives you a more authentic and less touristy experience of the Japanese countryside. 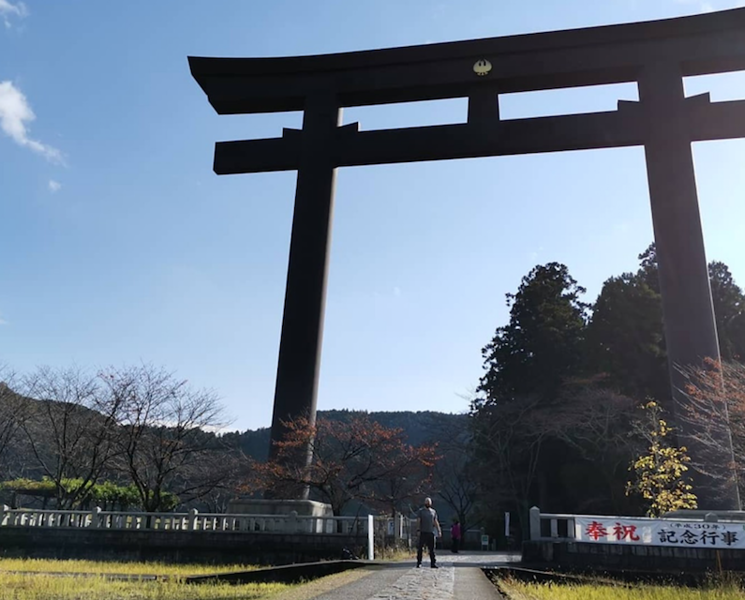 The Kumano Kodo is actually a network of several ancient pilgrimage routes that converge on Kumano Hongu Taisha Shrine, a powerful Shinto shrine in the mountainous heart of Wakayama Prefecture. 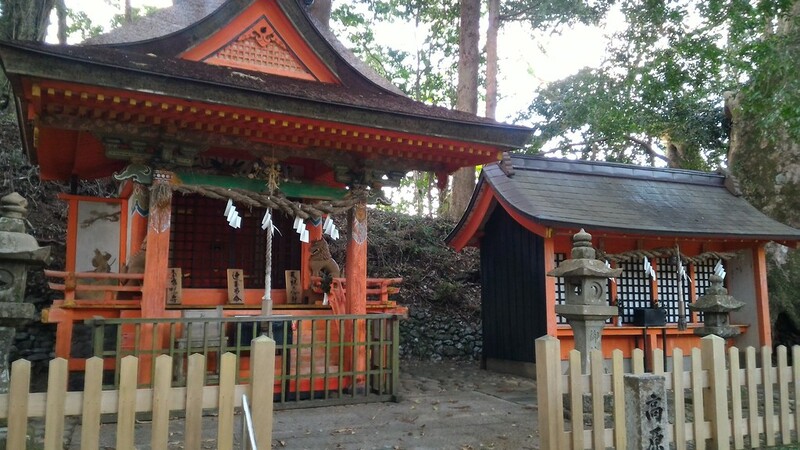 Hongu Taisha is the most important of three famous shrines known as the Kumano Sanzan. 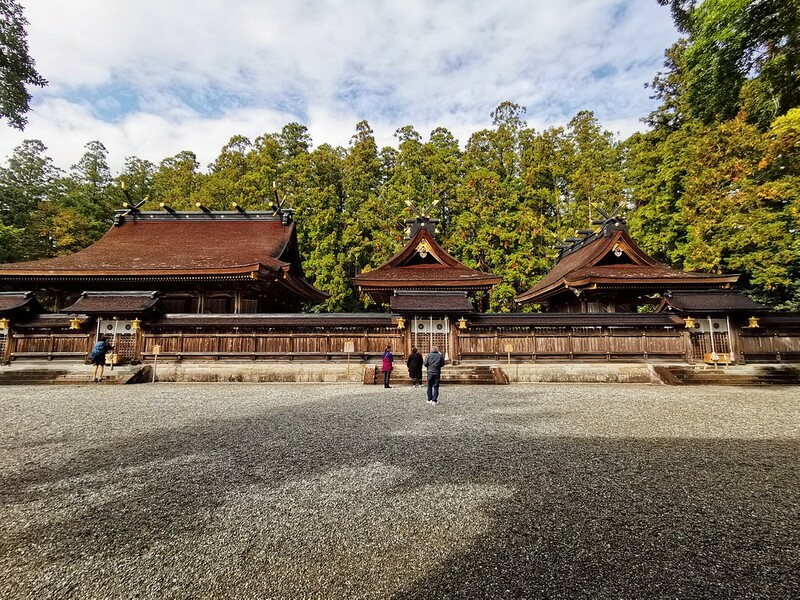 The other two, Kumano Nachi Taisha and Kumano Hayatama Taisha, are both near the eastern coast of Wakayama and are connected to Hongu Taisha by well-traveled pilgrimage routes. 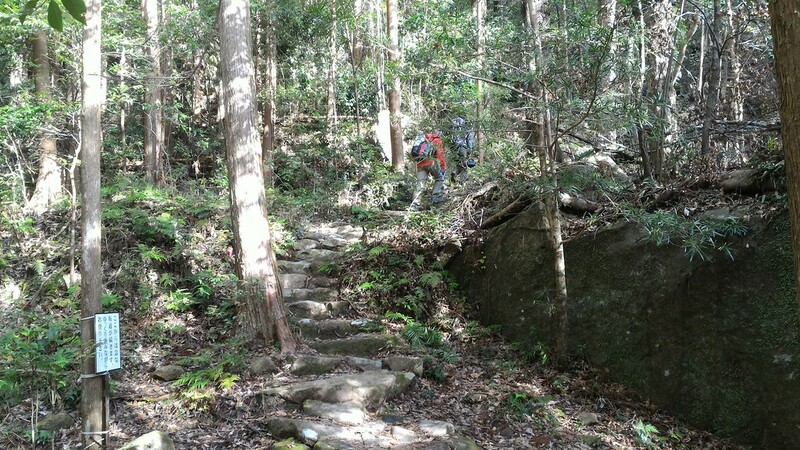 The most popular and accessible route is the Nakahechi, which starts at Takijiri, a trailhead about 15km west of Tanabe, the city on the west coast of Wakayama that serves as the main entry point for the Kumano Kodo (it’s accessible by express trains from Kyoto and Osaka. You can use a Japan Rail Pass for these journeys). 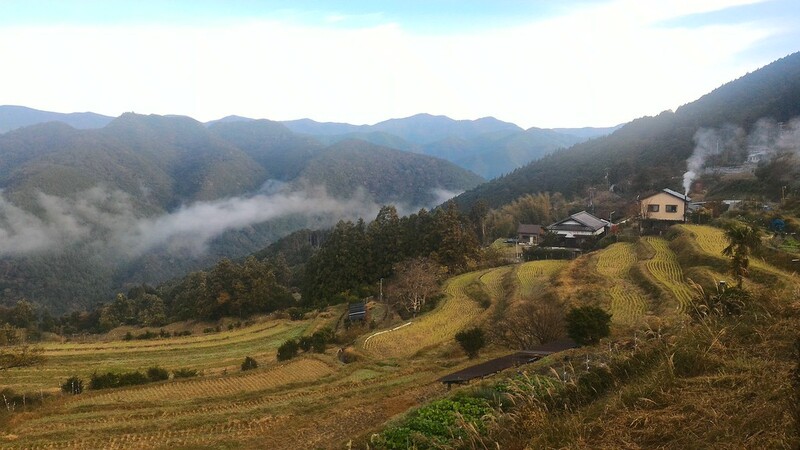 From Takijiri, it’s a three-day walk through the mountains to Hongu (home to Kumano Hongu Taisha). This is the walk we will describe in this article. 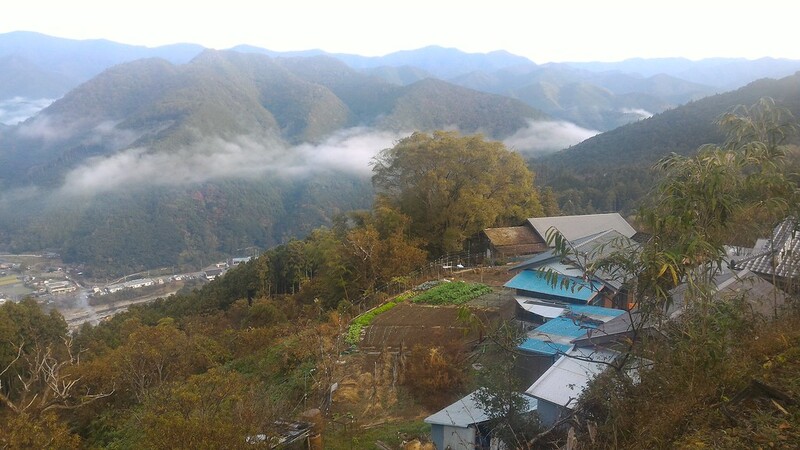 From Hongu, you can visit three nearby onsen (hot springs), continue hiking another three days to Kumano Nachi Taisha, or do several other nearby hiking routes. We also provide Google maps for each section of the hike in the hiking guide section of this article. 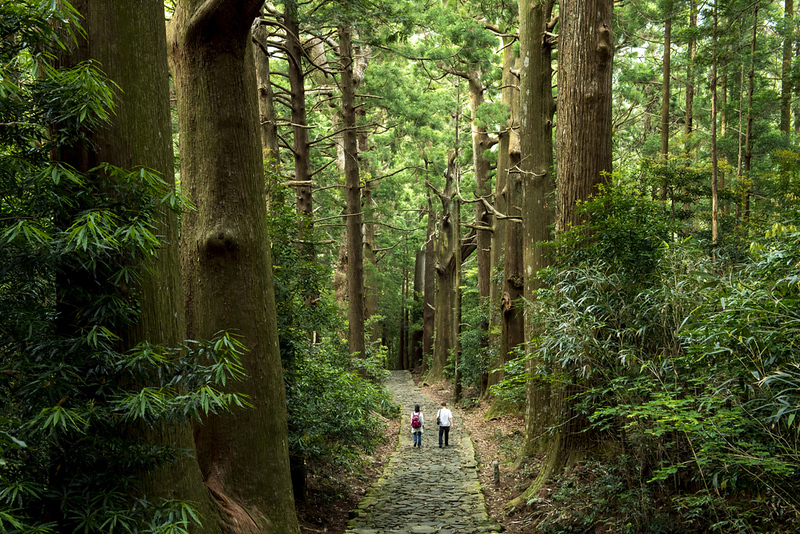 You can hike the Kumano Kodo year round. Wakayama is relatively far south in Japan and the mountains are not high enough to get much snowfall, but it can snow a bit in winter months (not usually enough to prevent travel). The advantage of winter is fewer crowds. Spring and autumn are both great times to hike, with warm weather and pleasant views (with cherries in late March/early April and fall foliage in October and November). Summer is great but it can be pretty hot and humid (but not as hot as the cities). The June rainy season can be wet, but it doesn’t usually rain every day. 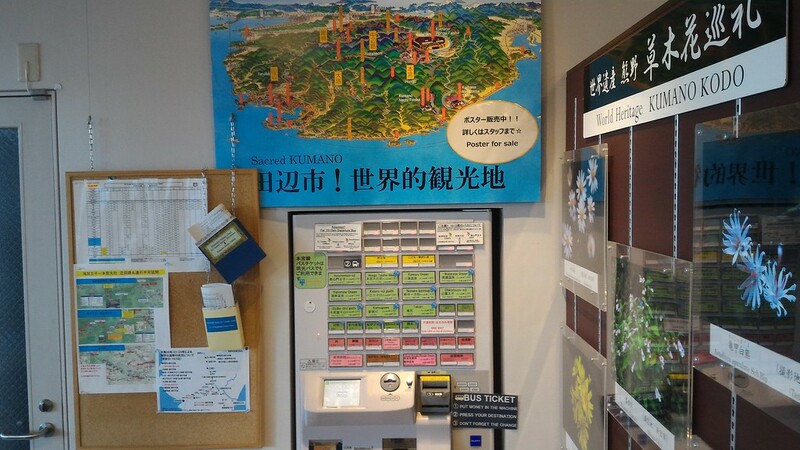 The Tanabe City Kumano Tourism Bureau runs the Kumano Travel Reservation System with which you can book lodging, luggage transfers and other services/activities. They also produce excellent maps and brochures about the area. The Kumano Tanabe booking service is relatively easy to use. Just note that you must make all your accommodation choices and fill all the boxes before you check out. 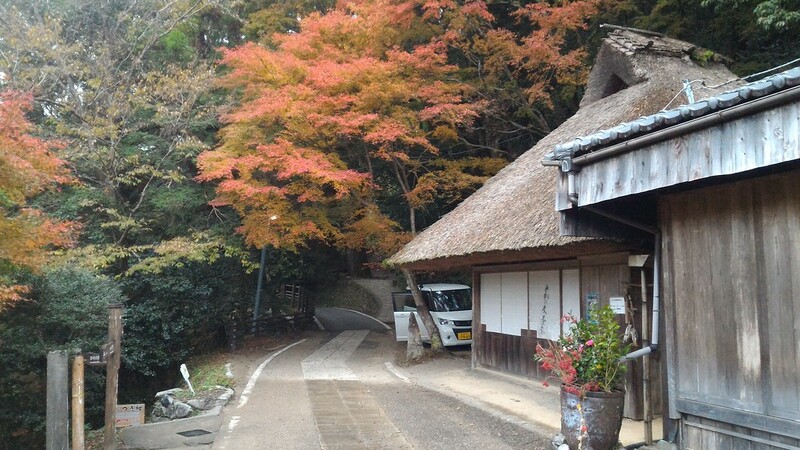 In addition, several of the Wakayama guesthouses and lodges on the routes can be booked through sites like Booking.com a and Agoda.com. This is a good choice for those who are already members of those sites or who want more flexibility than the official booking service provides. 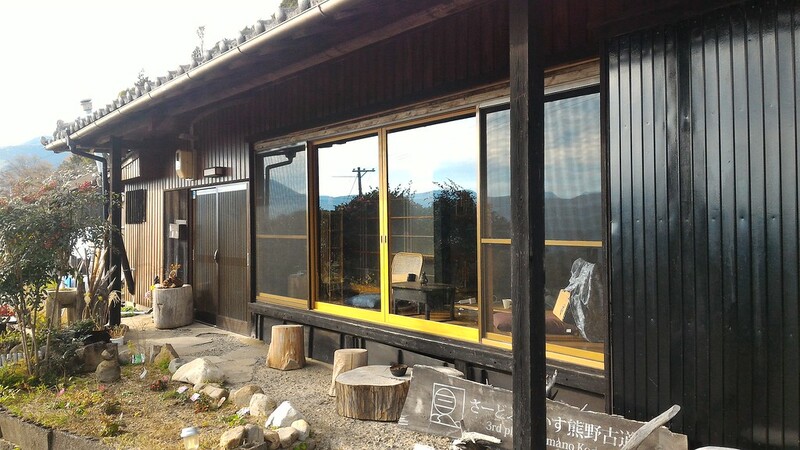 Guesthouse Ogawaya: This is one of the best places to stay in Kii-Tanabe. The rates are reasonable and it’s within walking distance of the station. 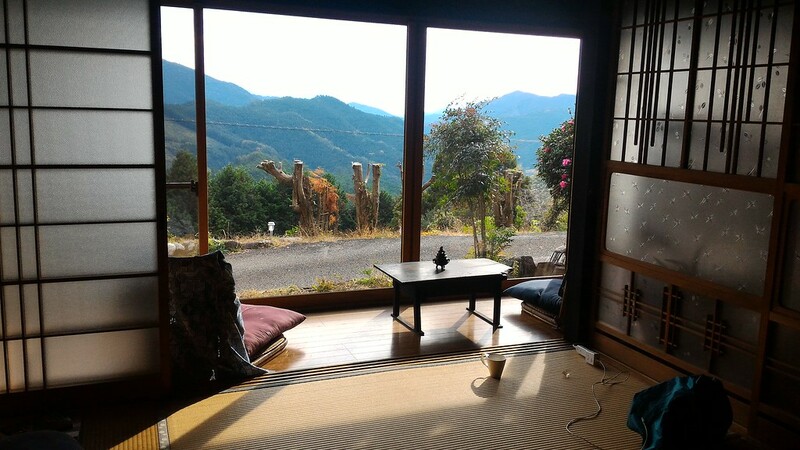 Kiri-no-Sato Takahara: This beautiful guesthouse in Takahara is a favorite of many Kumano Kodo walkers. 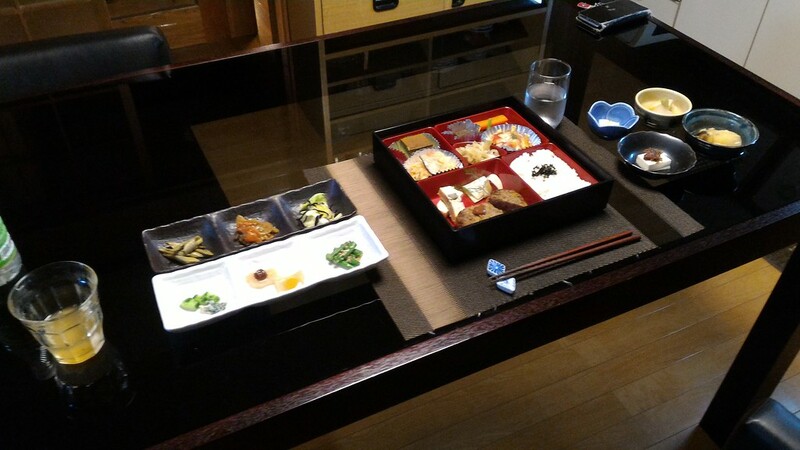 Hoshi-no-Jikan: If you’d like to stay in Hongu, this is an excellent choice. 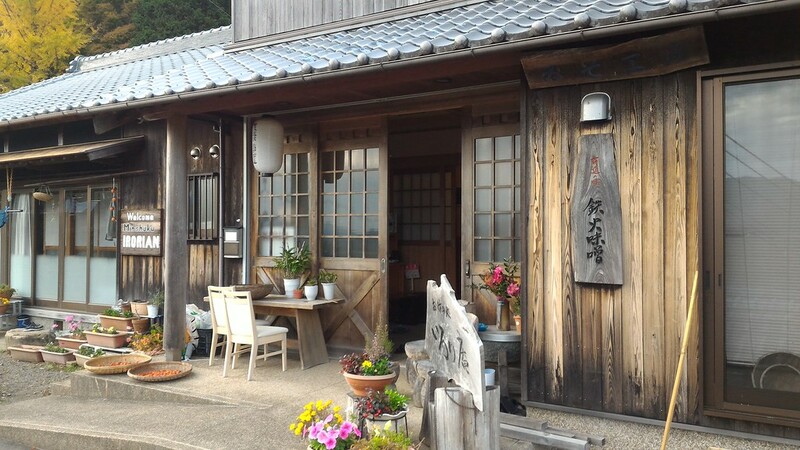 J-Hoppers Yunomine Guesthouse: If you’d like to stay in the quaint onsen town of Yunomine, this is a great choice. They’re more comfortable with foreign guests than some other places. 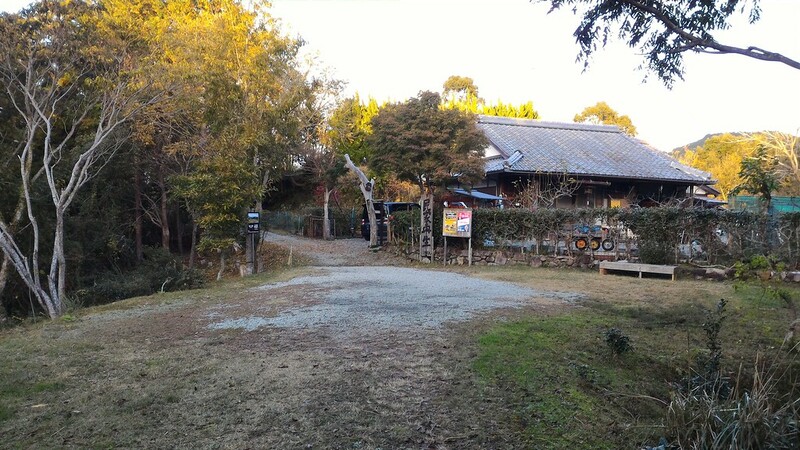 Ashita-no-Mori: This guesthouse overlooked the river and onsen in Kawayu is a nice and friendly place to stay. 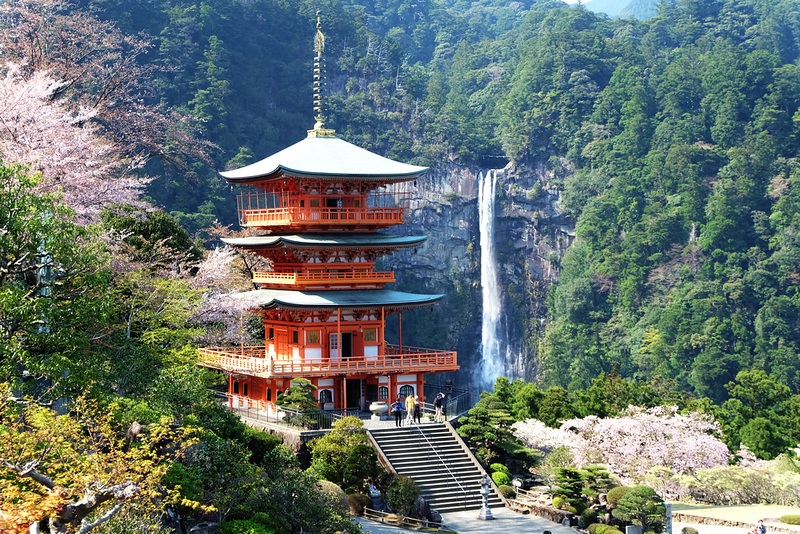 As noted above, the small city of Kii-Tanabe, on the west coast of Wakayama Prefecture, serves as the main gateway to the Kumano Kodo. 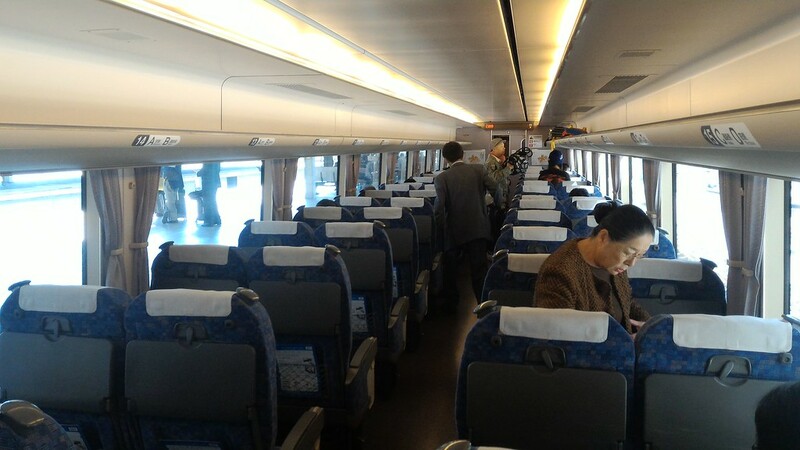 The best way to get there is by the Kuroshio limited express that runs about once an hour between Shin-Osaka Station and Kii-Tanabe Station. The journey takes about two hours and 15 minutes. 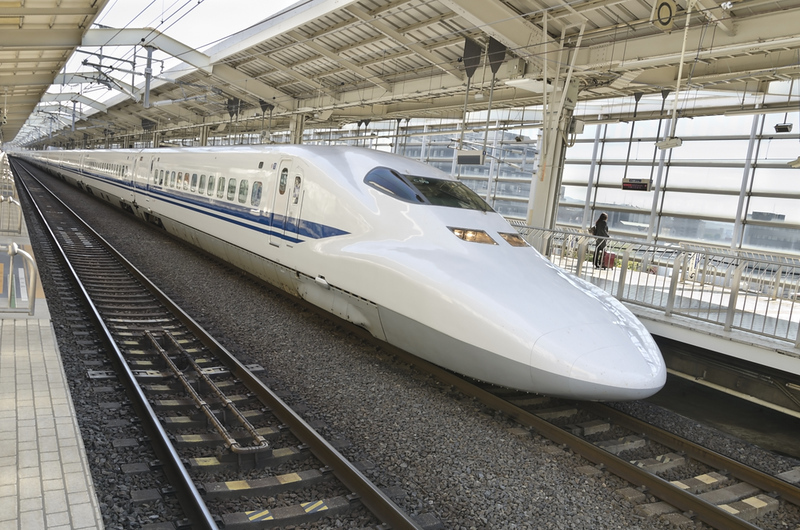 If you’re coming from Tokyo or Kyoto, you just have to hop on the Tokaido Shinkansen to Shin-Osaka and change there for the Kuroshio. At Shin-Osaka Station, exit the shinkansen concourse into the regular train concourse. 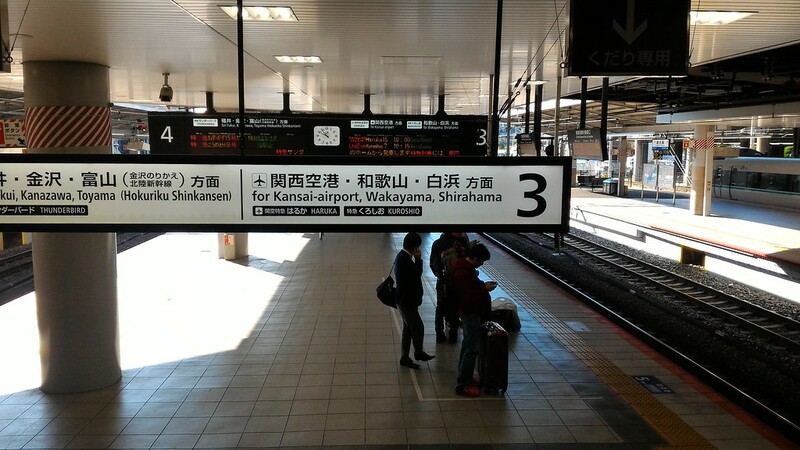 Follow the signs for Platform 3, which is where you catch trains south to Wakayama. 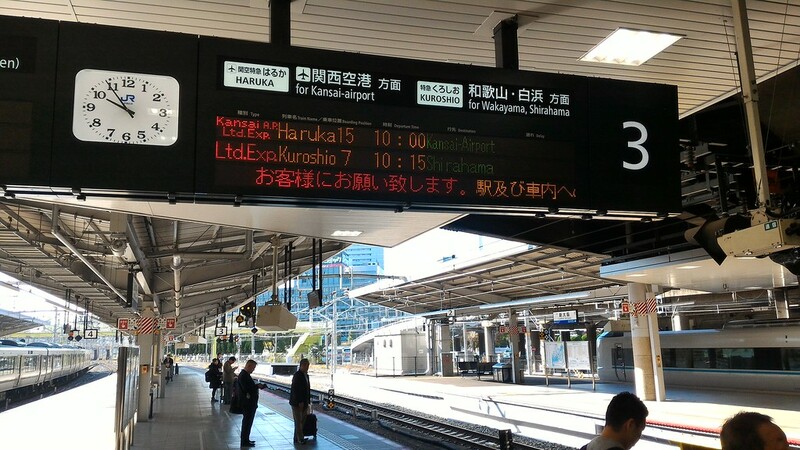 There is a departure board above the platform that displays in English when the next Kuroshio is departing (they go about once an hour). 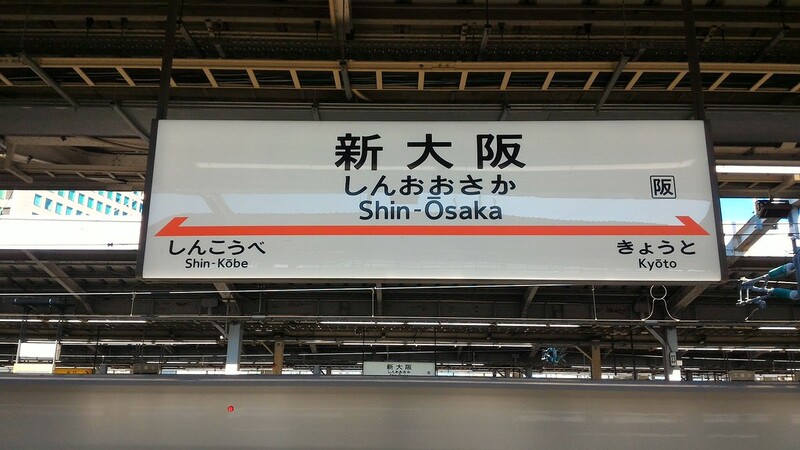 In most seasons, you’ll have no trouble getting a seat in the unreserved carriages (Shin-Osaka is where the train starts), but if you are concerned about getting a seat (say, in cherry blossom season), then you can reserve on in advance. Check the overhead signs to figure out where to stand to get into the right carriage. As you can see, the train is quite comfortable inside. 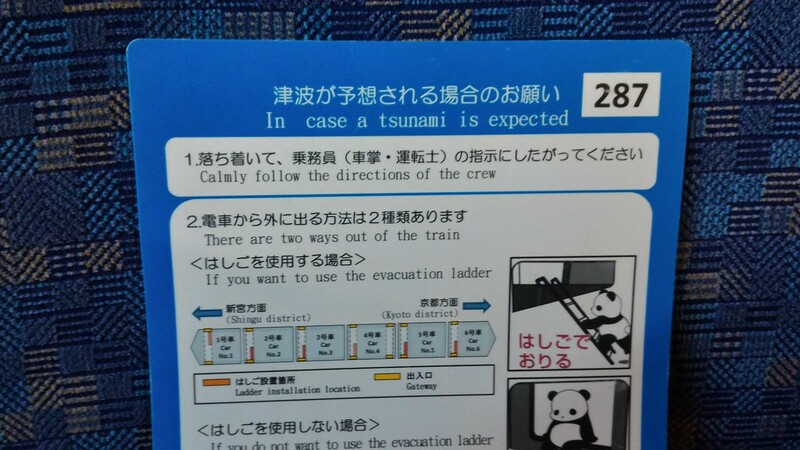 If you look in the seatbacks in front of you, you will find a notice explaining what to do in the event of a tsunami (or, perhaps it’s what to do in case you’re a panda and the train encounters a tsunami). 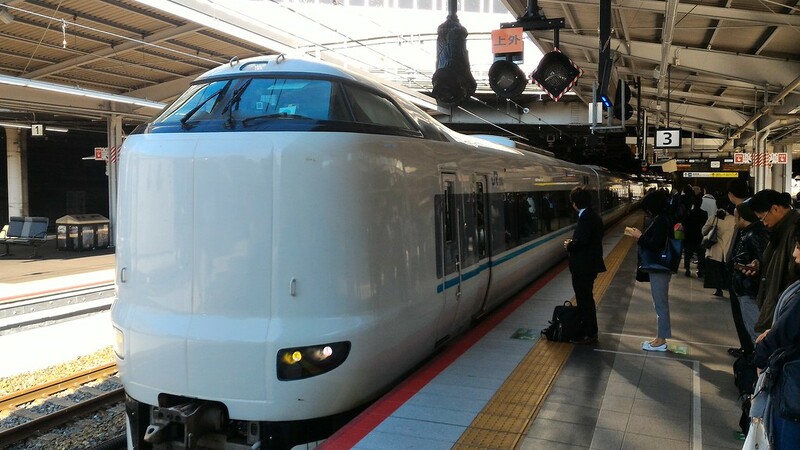 This is because the train runs along the Pacific Coast of Wakayama, often within sight of the sea. 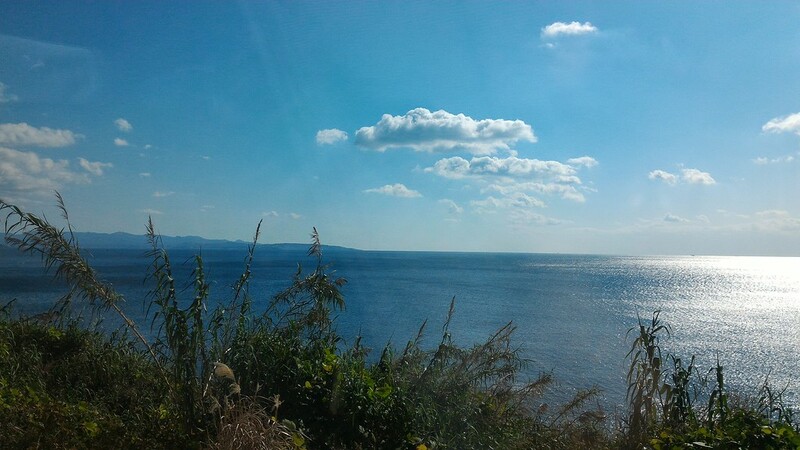 Once you get past Wakayama City, you’ll start to catch some lovely glimpses of the Pacific out of the left side of the train. 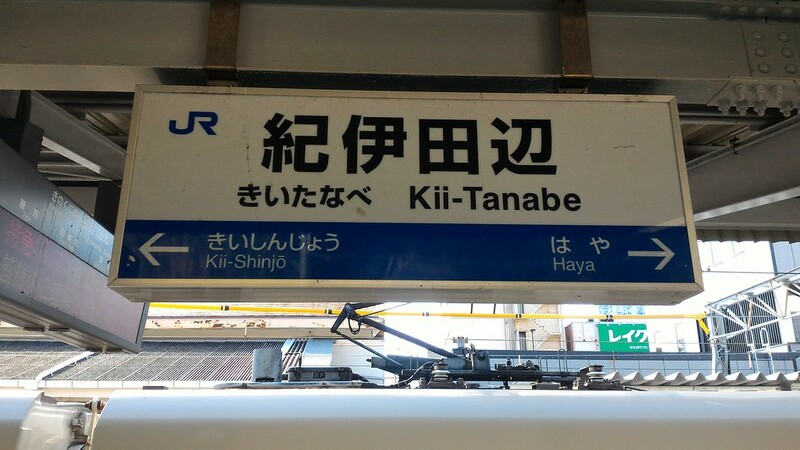 About two hours and 15 minutes after leaving Shin-Osaka, you’ll arrive at Kii-Tanabe Station, where you get off. 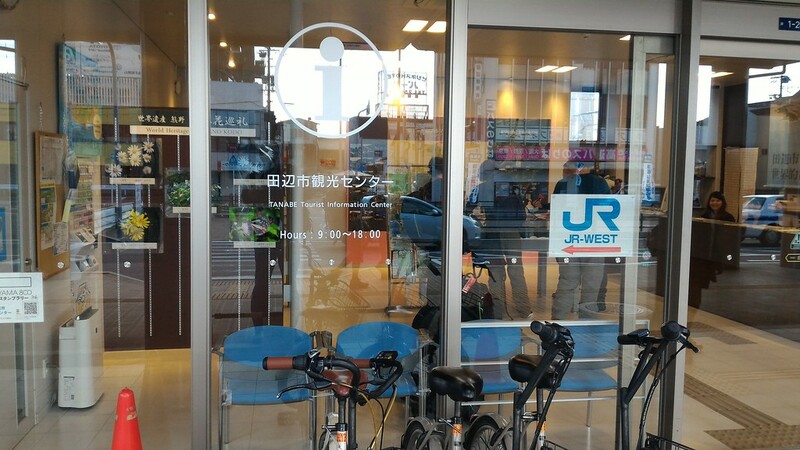 Just after leaving the station, you’ll see the Tanabe Tourist Information Center on your left. 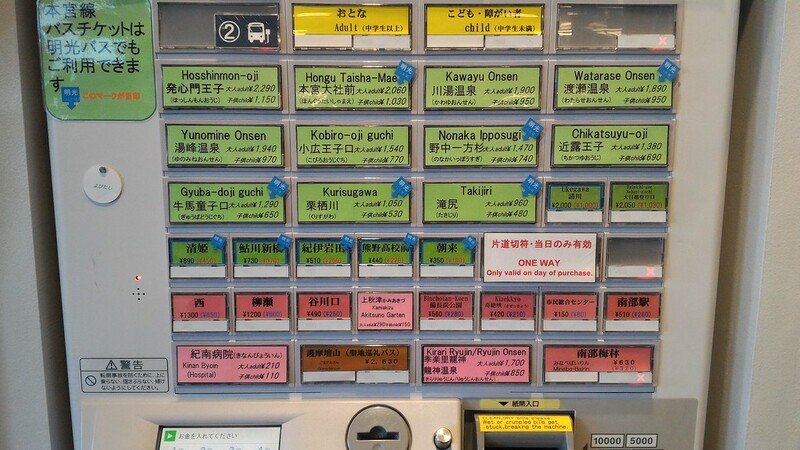 This is where to buy your bus ticket to Takijiri, the start of the Nakahechi section of the Kumano Kodo. 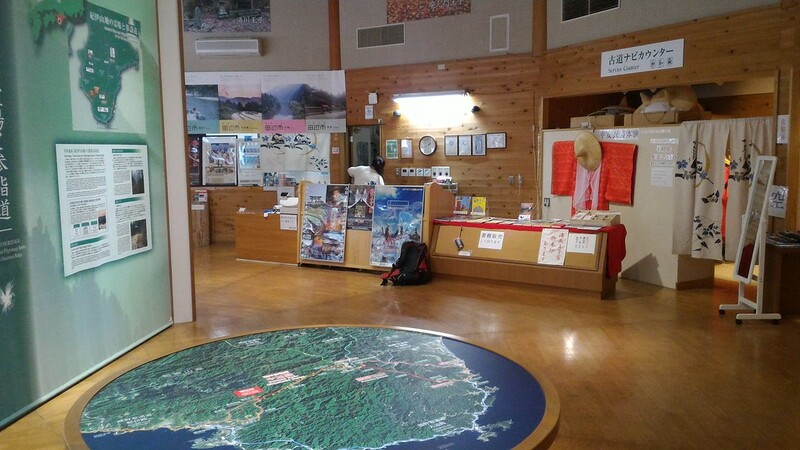 It’s also a great place to pick up a route guide (in this case, the “Kumano Kodo Nakahechi Pilgrim Route Map”). You can also ask questions in English of the helpful people who work there. You will find the ticket vending machine opposite the information counter. The ticket machine has buttons clearly marked in English. Buy a ticket for Takijiri. Wait for your bus at Bus Stop #2 just outside the information center. 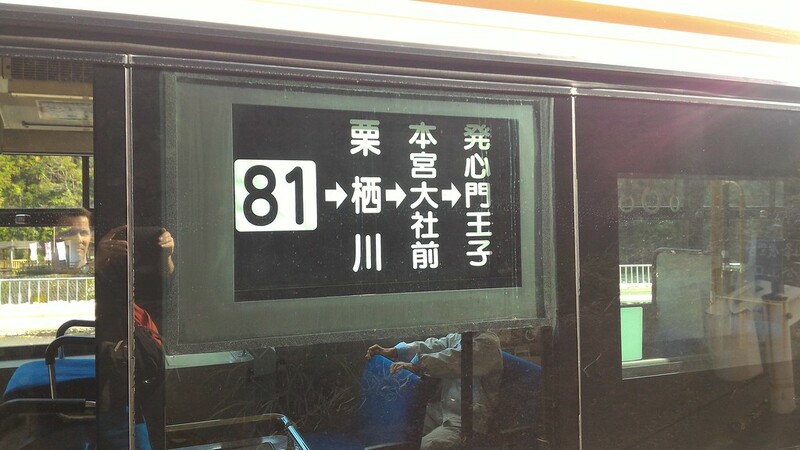 The route number is displayed on the bus. 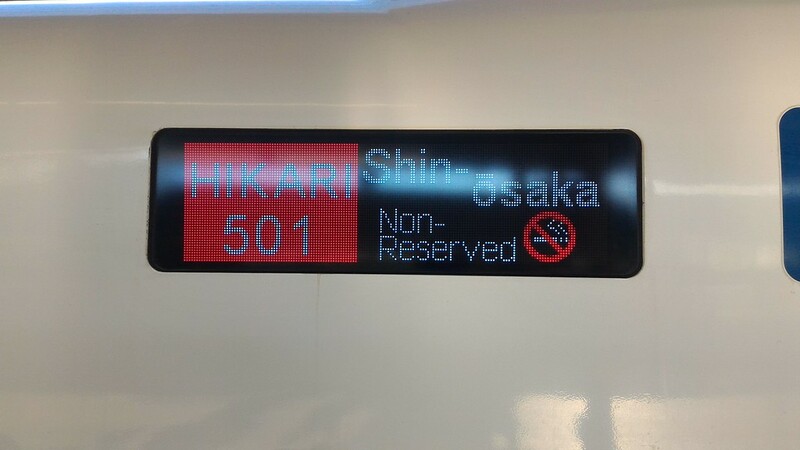 Sometimes, the destination will also be written in English, but often only in Japanese (so confirm the number with the people at the information office). 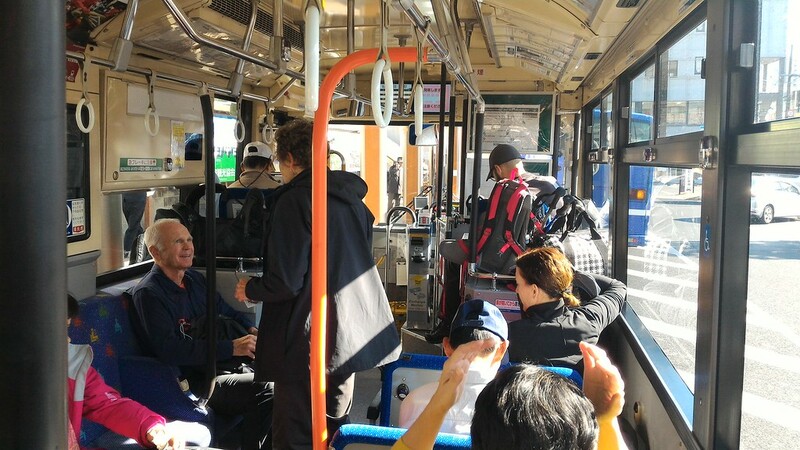 The bus will often be crowded with other hikers heading to the Kumano Kodo. 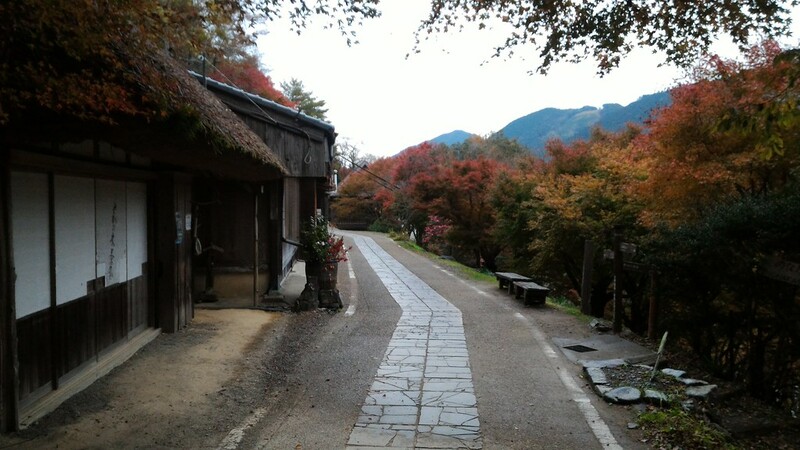 The walk we describe here is the main Nakahechi Route, which runs from Takijiri to Hongu, with overnight stops en route in the villages of Takahara and Nonaka (sometimes referred to as Tsugizakura-oji). If you’re fast, you can get to Hongu on the last day in time to get on a bus to Kii-Tanabe and catch a train north to Osaka on the same day. However, it’s much more relaxing to spend a third night in Hongu or an onsen town nearby before heading back to the coast and heading north. 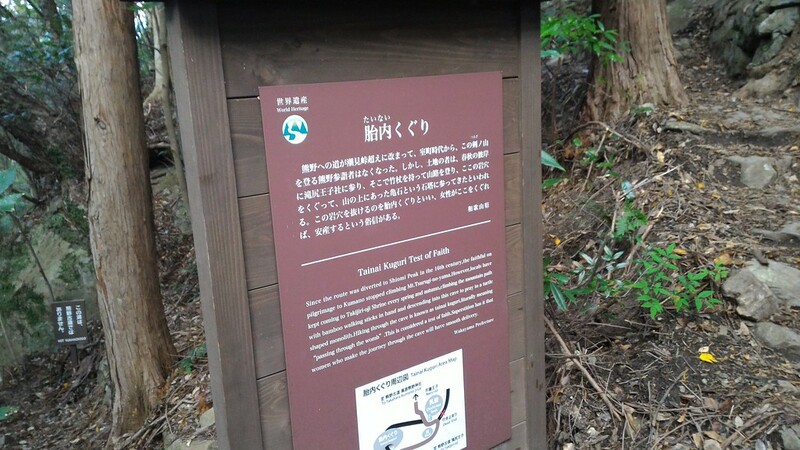 The bus from Kii-Tanabe Station to the trailhead at Takijiri takes about 40 minutes. You put your ticket into the machine at the front of the bus when you get off. 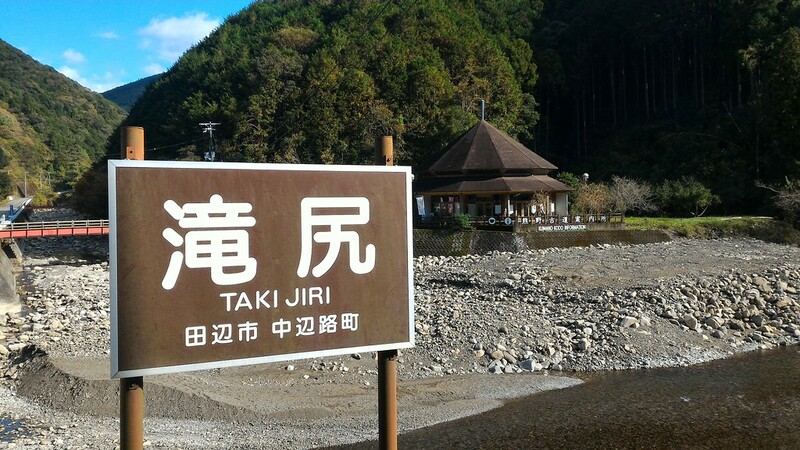 As soon as you get off, you’ll see the Takijiri Information Center across the river from you. This is a good place for a last-minute bathroom break or to grab a map. 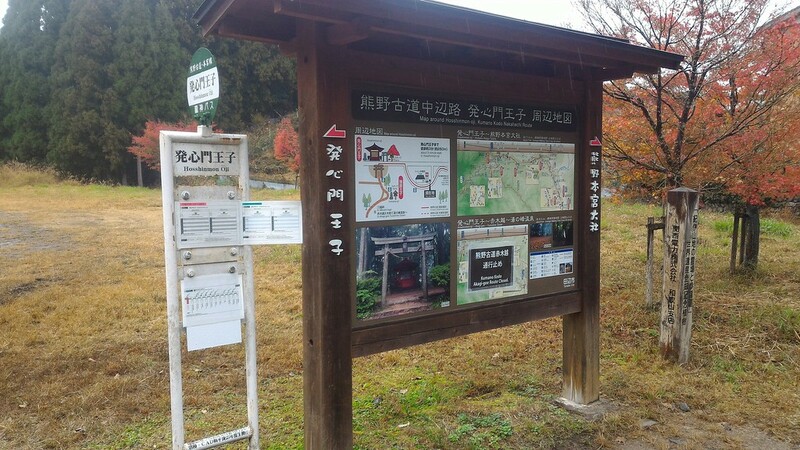 The actual trailhead is behind Takijiri-oji Shrine, across the road from the information center. 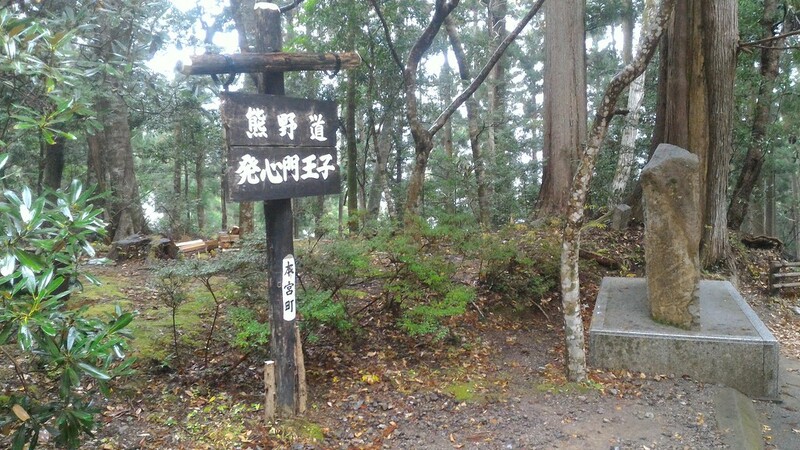 The trailhead is marked with a sign, indicating that it’s 3.7km to your first night’s stop: Takahara. 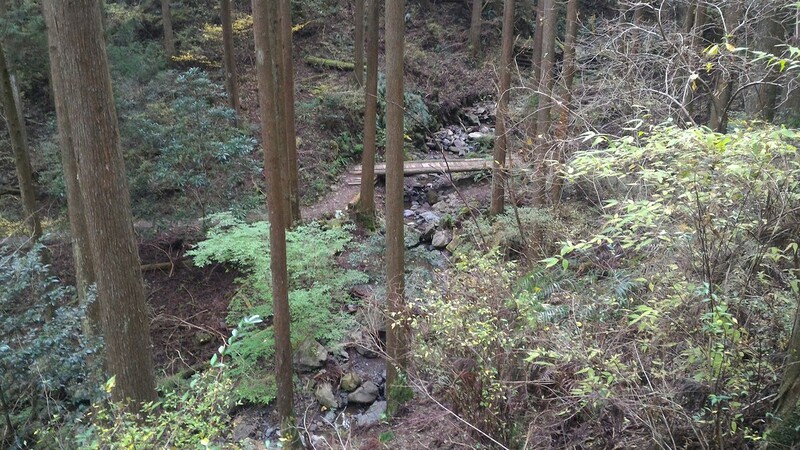 The trail climbs continuously through forest above Takijiri. The first landmark is the Tainai Meguri. This is a turtle-shaped rock (actually, a collection of rocks) that you can crawl through. The name means “passing through the womb” and it might remind you of the Tainai Meguri at Kiyomizu-dera in Kyoto. It is said to insure a smooth deliver of babies for women and general good luck for men. Be warned, it’s a lot narrower than you might expect. You really have to crawl and slither to get through it. Take off your pack and push it ahead of you and pass it to someone on the other side. And, if you suffer from claustrophobia, just walk around the rocks. 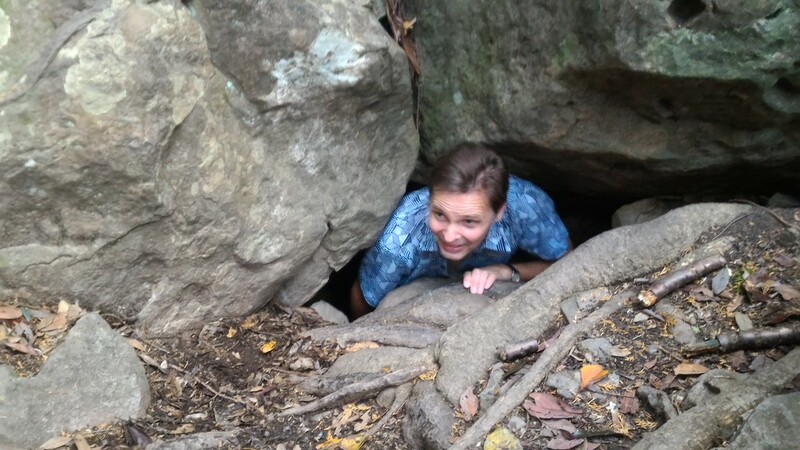 Here’s a picture of me emerging from the Tainai Meguri. 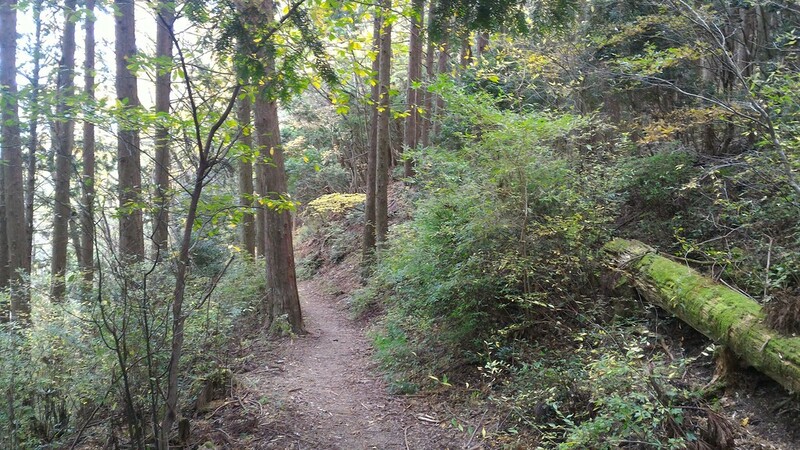 Soon after the Tainai Meguri, the trail reaches a peak, after which it starts to descend. You’ll soon come to a fork, the left side of which leads to a lookout point which offers a nice view (either fork will get you to Takahara – the trails rejoin later on). 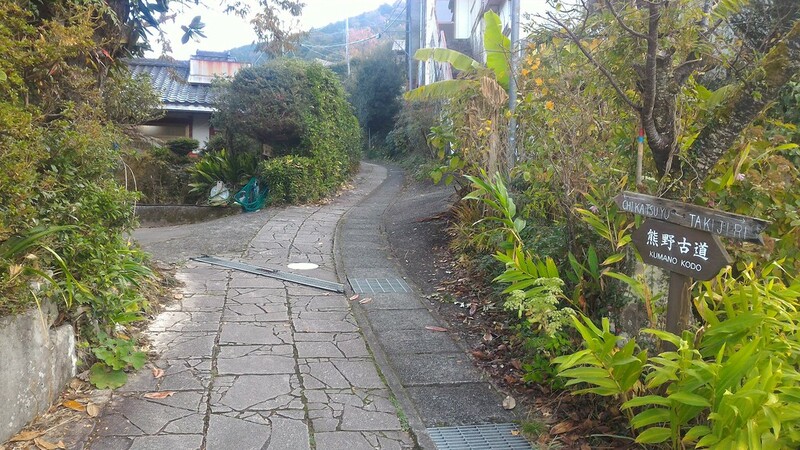 After descending for a while it briefly flattens out and then you start the steep final climb up to Takahara. 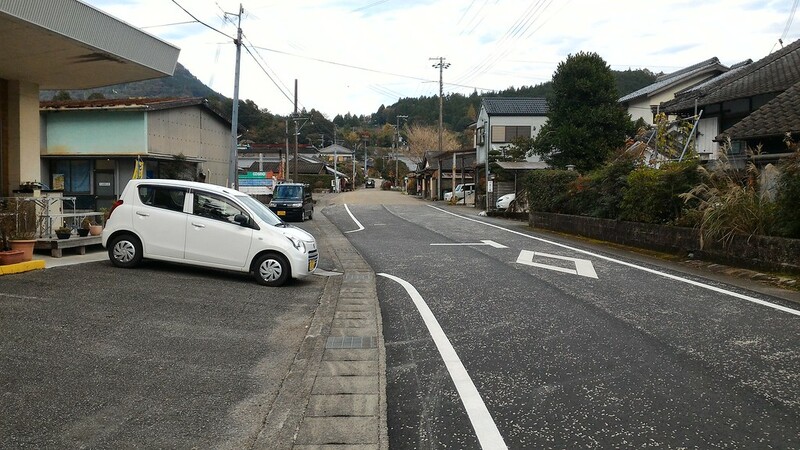 Soon after passing a TV tower, you enter the village of Takahara. 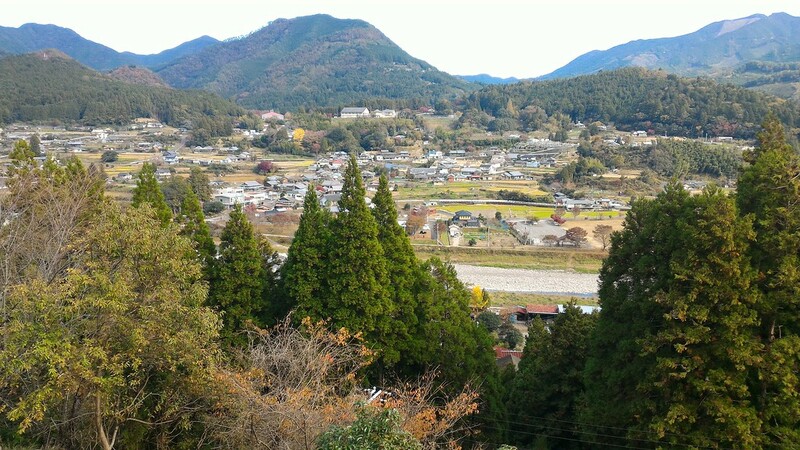 The village of Takahara is incredibly picturesque. 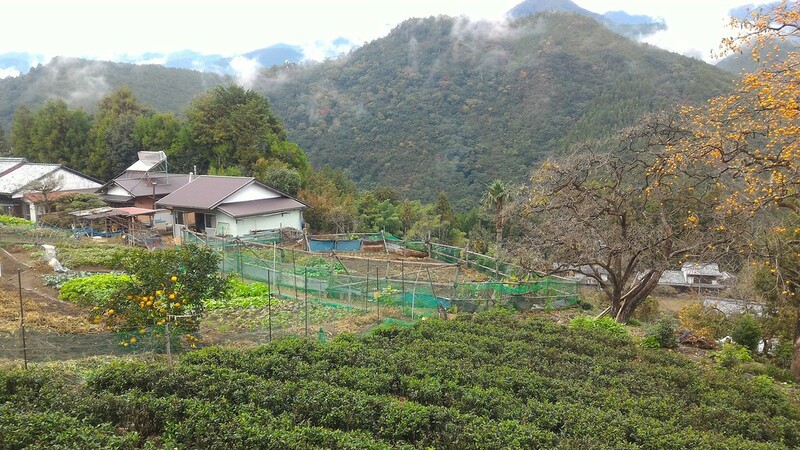 Most of the accommodations in the village are marked on the maps produced by the Tanabe Kumano Tourism Bureau (note that some are before the main part of the village, some are in the village and some are on the far side). After checking into your guesthouse, dropping your pack and taking a break, head out and explore the village. The views from the village over the valley and mountains are lovely, particularly in early evening. 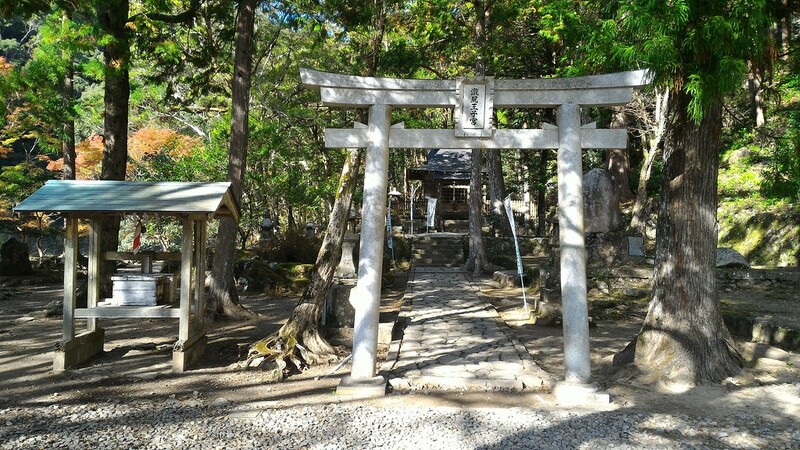 The highlight of the village is lovely Takahara Kumano-jinja Shrine, just off the main road through the village. 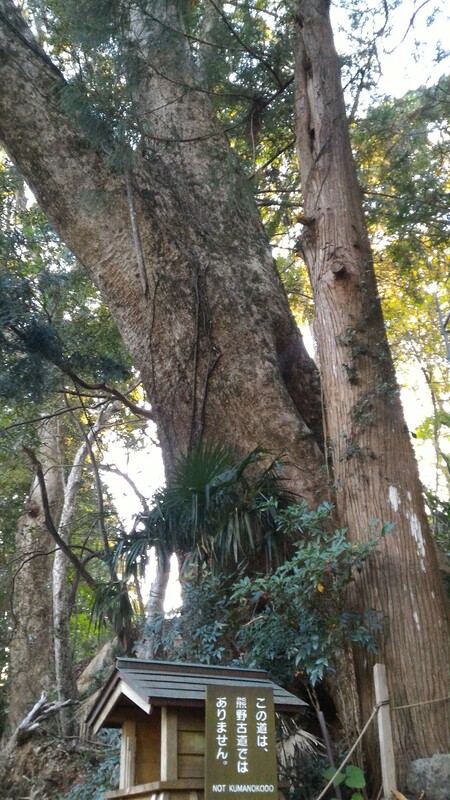 There are some enormous camphor trees at the shrine. These call to mind the magical tree in Hayao Miyazaki’s fantastic movie “Totoro.” They have been the spiritual heart of this village for centuries and you can still feel their power. It’s no wonder they built the shrine here. In my case, I chose to stay at Hoshizora-no-Yado, a guesthouse built with fantastic timbers in the traditional Japanese fashion. It’s on the west side of the village, just after you enter Takahara. There are only two rooms here, one upstairs and down. The upstairs room has the view but it’s less private. The downstairs room has no view, but is very private. Take your pick. 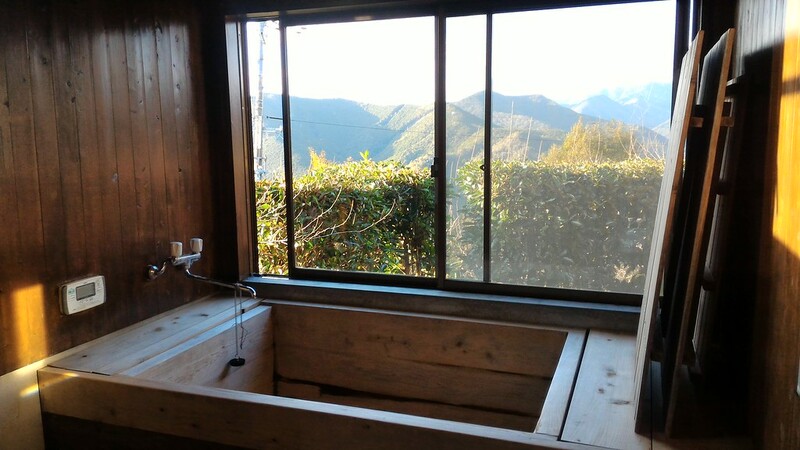 The view from the bathtub at Hoshizora-no-Yado is fantastic. What a way to end a day of hiking! The dinner is also excellent. 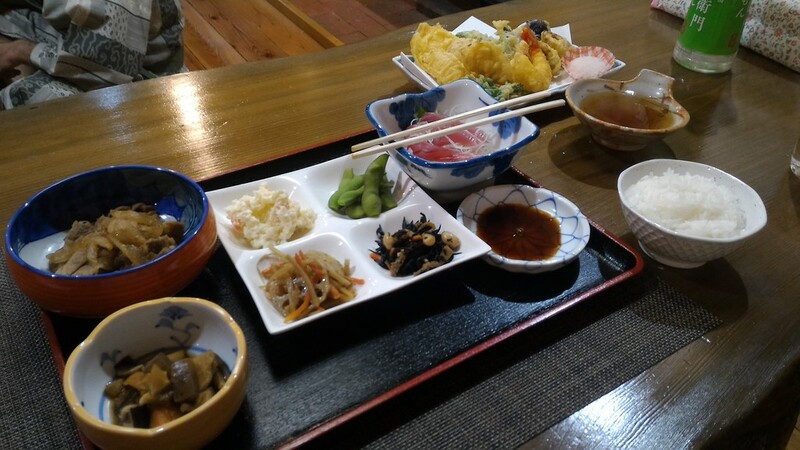 It should be noted that there are other good accommodations in Takahara, including the excellent Kiri-no-Sato Takahara Lodge, which you can easily book via Booking.com. Today is a solid day of hiking that takes you through some nice mountain scenery. After breakfast at your lodgings, you can enjoy the morning views from Takahara. There’s often mist down in the valleys, which makes for great photos. If you need extra caffeine before starting, there’s a vending machine in the center of the village that sells coffee and tea. The trail is well marked out of the village. It’s a nice scenic trail out of the village. 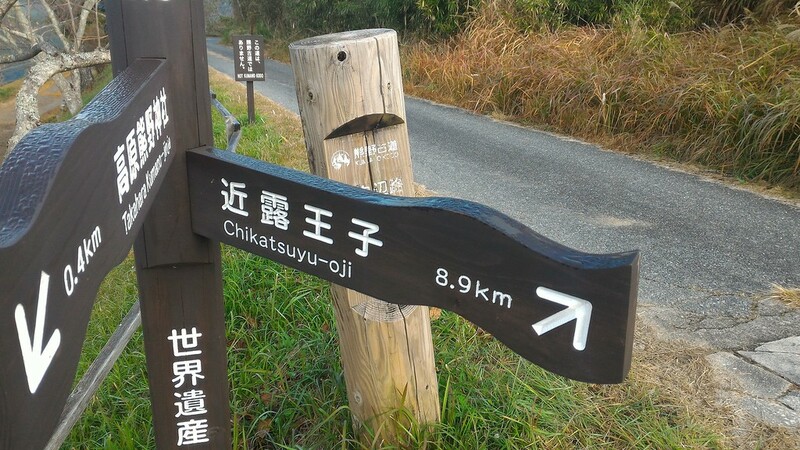 You’ll soon come to a road and a sign indicating the distance to the next village, Chikatsuyu. The trail winds through second-growth forest, with some gentle climbs and descents for the next few hours. Eventually, you’ll start to descend more steeply and come to a bridge. 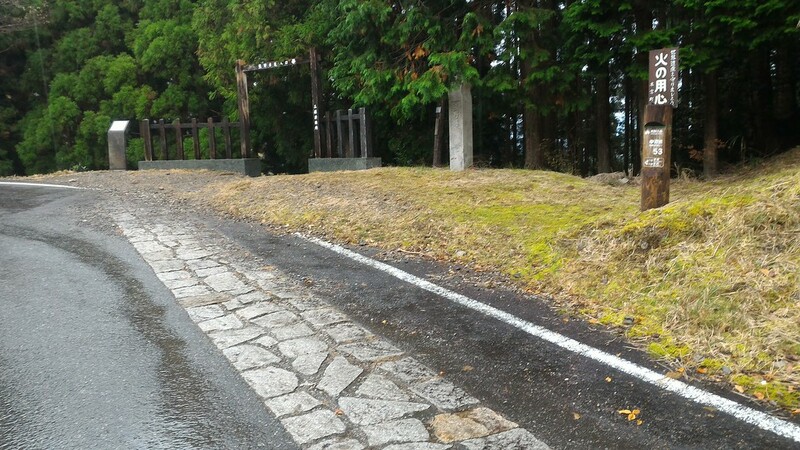 Shortly after crossing the bridge, you’ll come out to a fairly major road, on the other side of which is a “Michi-no-Eki” (a rest stop for motorists). There are vending machines and bathrooms here. 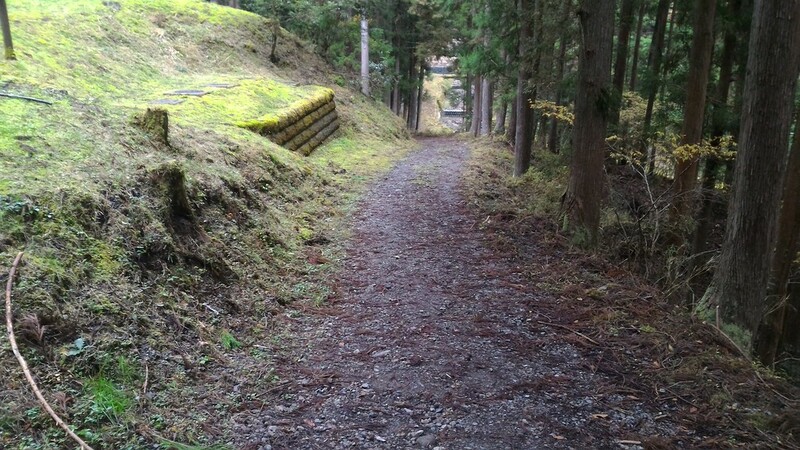 To get back on the trail after the Michi-no-Eki, cross back over the road and go to your right, working slightly uphill. 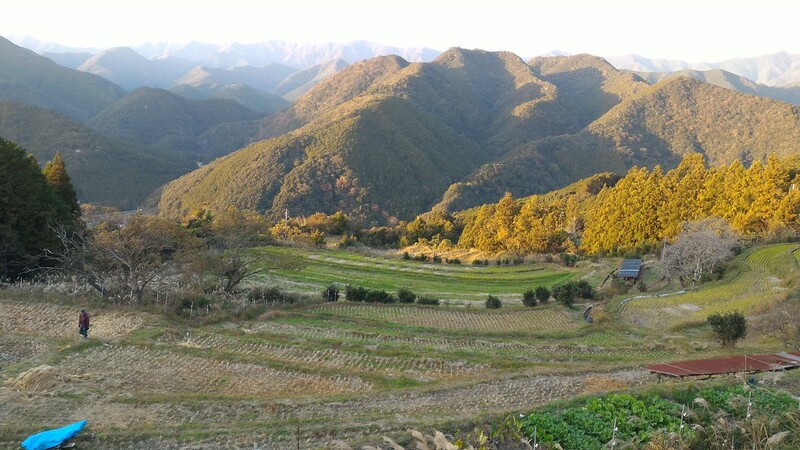 From here, there’s a brief climb before you start to descend into the village of Chikatsuyu. Chikatsuyu (literally “Near Dew”) is a relatively large village with a few small shops, a post office (with an ATM) and one or two restaurants, as well as vending machines. The route goes right through the middle of town. The route finding gets a bit tricky as you leave Chikatsuyu. You’ll need to pay attention to stay on track. You’ll pass a few small farms above the village. 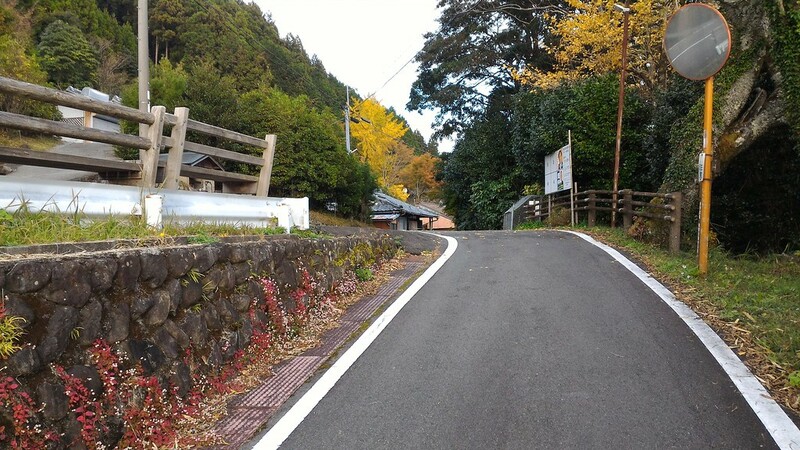 You’ll go in and out of forest and eventually wind up on the narrow paved road that leads up to your destination, which is variously and confusing called Nonaka, Hisohara-oji and Tsugizakura-oji. Most of the accommodations are near where this road joins the upper road. But, a few down the hill (meaning, you walk along the upper road then descend again). Once you get to the upper road, check the map carefully and locate your lodgings for the night. 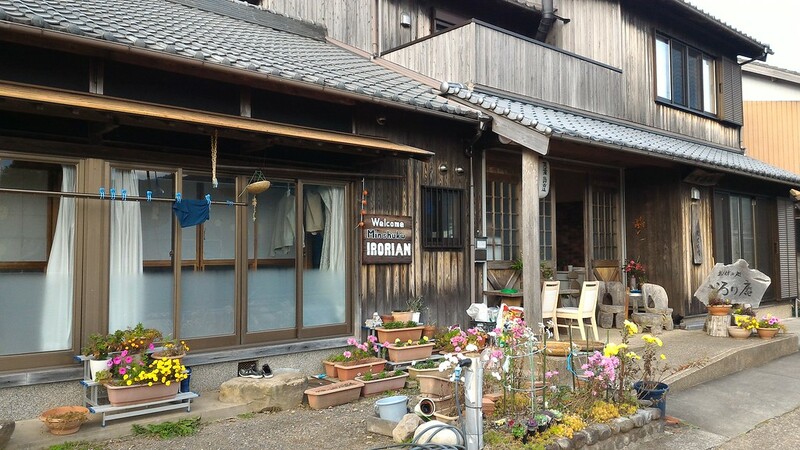 One good place to stay here is Minshuku Irorian. The place I stayed in is called Minshuku 3rd Place. It’s to the left when you get to the road junction (meaning, take a hard left when you get to the upper road). This place is called 3rd Place because it’s the third house in the village. It’s actually two small self-contained houses that are more like vacation rentals than guesthouses. I loved it. The views from the houses are great. The owner, Tetsu, speaks some English and is a great guy. The dinners served here are excellent and include a lot of local ingredients. And before or after dinner, you can take a piping hot bath. Okay, this is your long day. 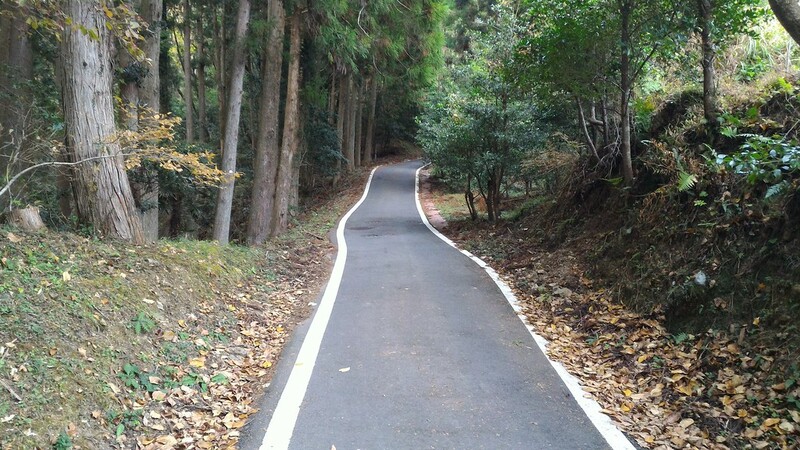 If you’re going to walk the entire route to Hongu, you’ll need a relatively early start, especially in winter. There can be some tricky route finding, particularly in the afternoon, so you’ll have to keep your wits about you. The day starts off with the incredible Tsugizakura-oji Shrine, which is just down the road from the guesthouses. It’s really lovely and has some enormous sugi (cedar) trees. 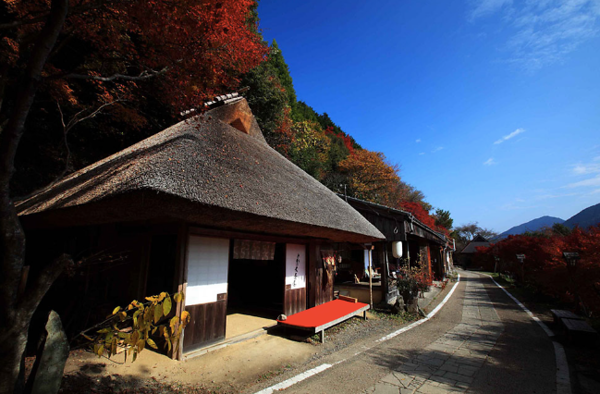 Just past the shrine is a lovely thatch-roofed teahouse. This is probably the single most beautiful section of the hike. This section is particularly beautiful in the fall, which is when I hiked it. You’ll continue along the paved road for a while. The trail leaves the road after it makes a sharp descent. There’s a small covered shelter here. There are two ways to go here. You want to take the uphill route. You’ll climb through a second-growth forest to your first pass of the day: Waraji-toge Pass. It’s a pretty easy climb. 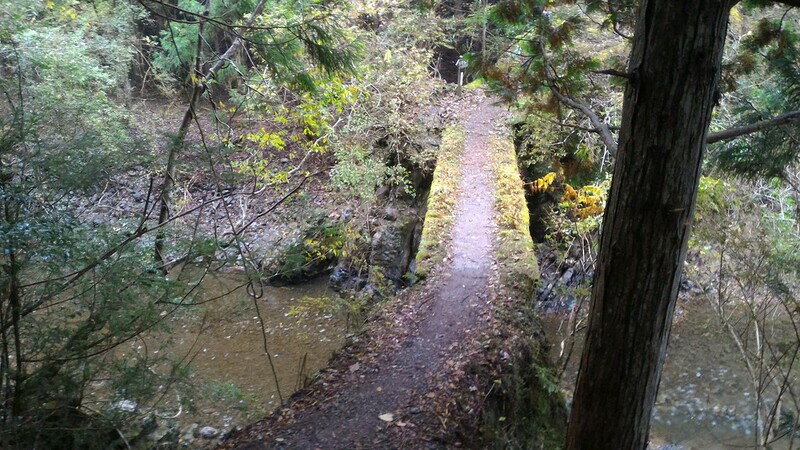 After crossing Waraji-toge, you’ll come to a bridge across a small river. After crossing this, you’ll ascend continuously to Detour Pass (so named because this section is a detour around an older section that was destroyed in a landslide). The pass is just a hair under 700m and it’s the highest point of today’s hike. In good weather, there are good views on either side of the pass. After the pass, you’ll descend once again, noting a huge landslide to the right of the trail below the pass. You’ll eventually reach a mountain road. You’ll follow the mountain road for a while before the trail branches off down a hill on your right. This leads to a river, which you will follow for a while before the trail starts to climb again, eventually reaching Mikoshi-toge Pass. This isn’t such a bad climb – at least not quite as high as Detour Pass. The actual pass is a road, on the other side of which you will see a gate leading to the trail down the opposite side. After crossing the pass, you’ll descend through forest and eventually pass an area below a previous landslide that has been concreted over to form a huge concrete wall on the mountain (and one hell of an eyesore). After this, you follow a mountain road for quite a long stretch. This is a rather drab section of the trail, but there are some nice views of the mountains along the way. The route finding here is a little confusing and the route has apparently changed a bit recently. The maps warn of the trail descending sharply to meet a river, but I couldn’t find this junction and wound up following the road all the way to Hosshinmon-oji. Hopefully, signage will have improved by the time you get there. 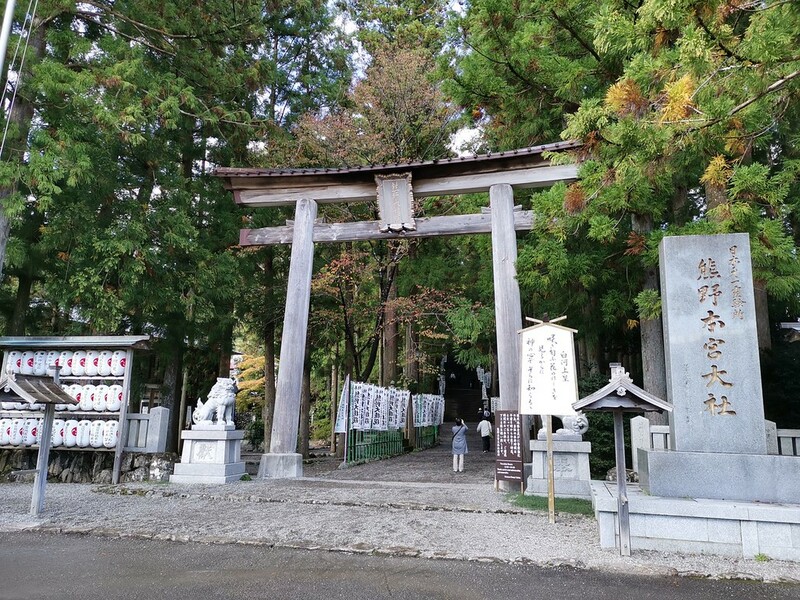 You’ll be pretty happy by the time you get to Hosshinmon-oji, which is a small shrine in the woods. The road from here leads down to a bus stop and a village (with vending machines in case you need some caffeine, as I certainly did by this point). You can catch a bus from here down to Hongu, but if you have the energy, I definitely recommend walking since the next 7km are mostly downhill and take you through some extremely picturesque little villages. In fact, it’s one of the nicest sections of the entire walk. 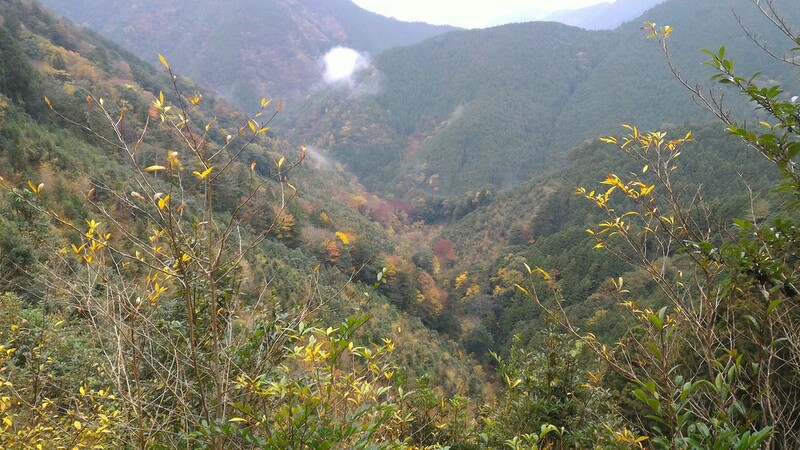 Here’s a typical view of the route below Hosshinmon-oji. 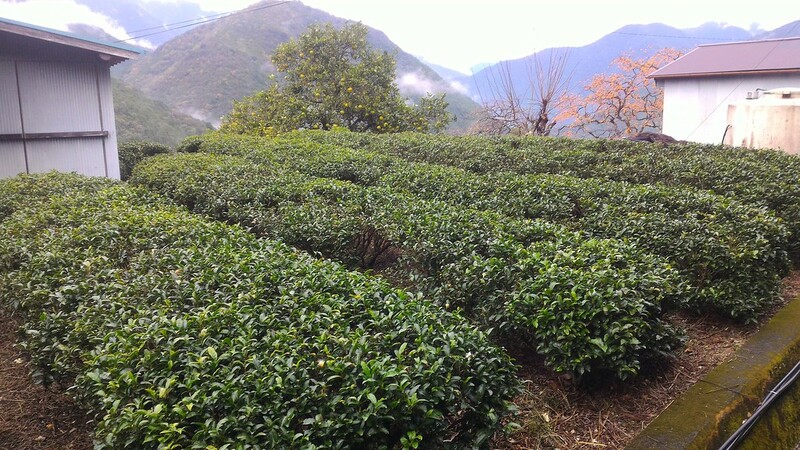 You’ll see lots of things growing here, including tea, rice and yuzu. 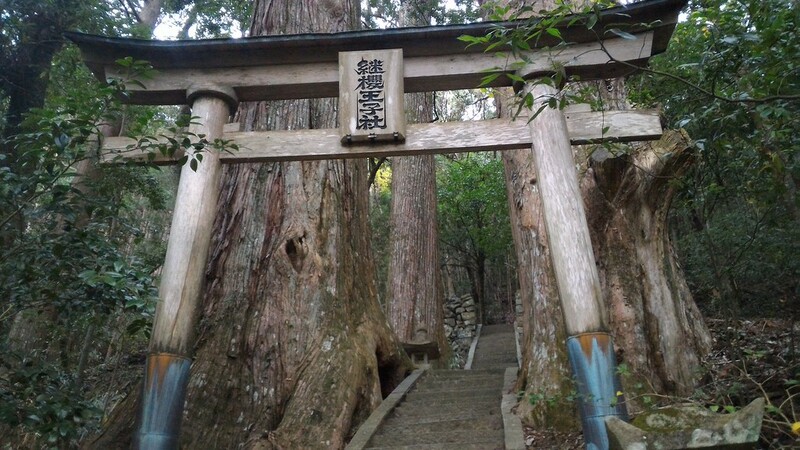 Eventually, after one more section in the forest, you’ll come to the outskirts of Hongu and to the side entrance of the goal of this trek: Kumano Hongu Taisha. The following pictures were taken by my friend Nelson Alvarez, with whom I walked this route. Now, it’s time to go into the shrine and give thanks for a successful trek. You will feel the power emanating from the inner hall of the shrine. You can see why this became such a major spiritual center in Japan. When you are done paying respects at the shrine, exit down the main steps and out to the main road. 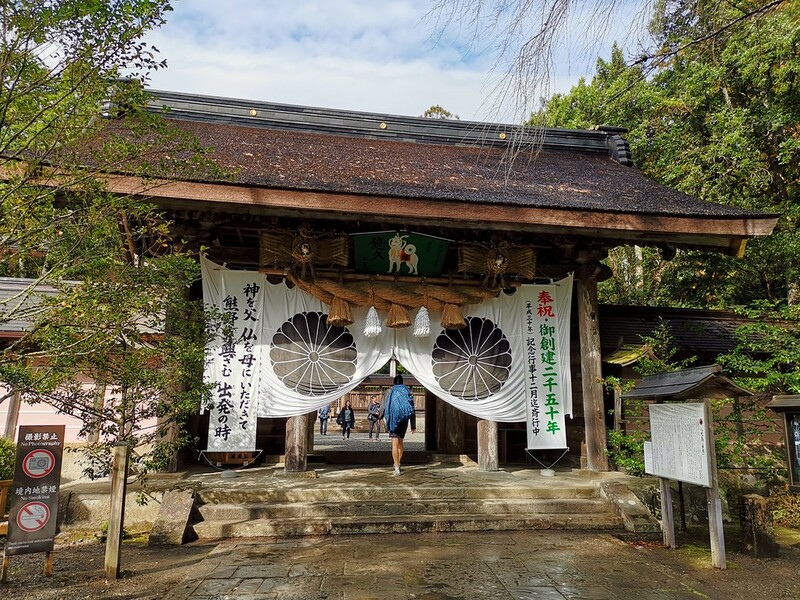 In the center of town, a short walk from the shrine, you will find Kumano Hongu Heritage Center, beside which is the main bus stop. 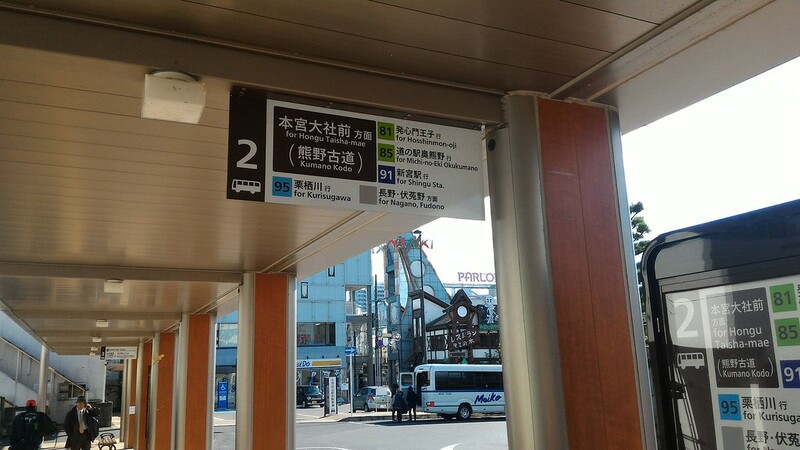 Here is where you can catch a bus back to Kii-Tanabe, or on to your next destination (see the following section). Also, there are several guesthouses, restaurants and shops in Hongu itself. 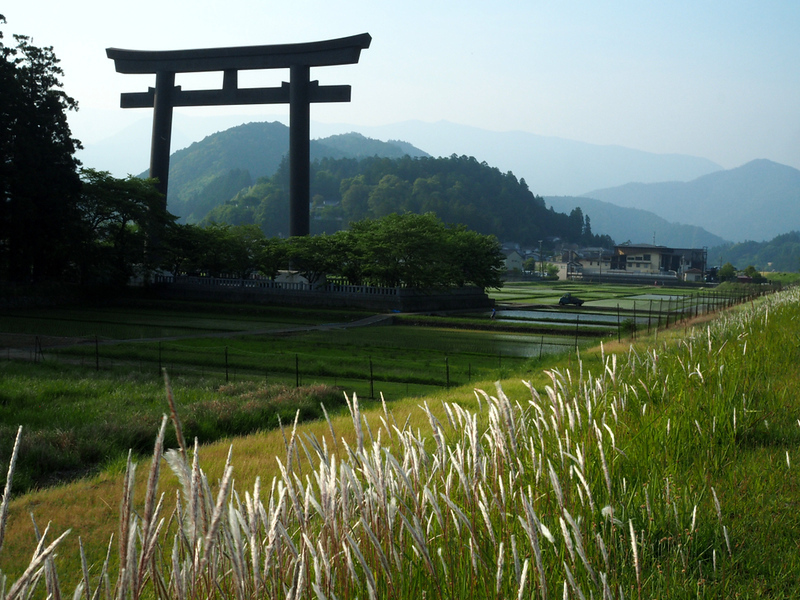 Finally, you will find a huge torii (Shinto shrine gate) towering above the river behind the Heritage Center. This is a good place for a final picture from the trek. If you’d like to head straight back to the big cities of Osaka, Kyoto and onward, then skip to the following section. 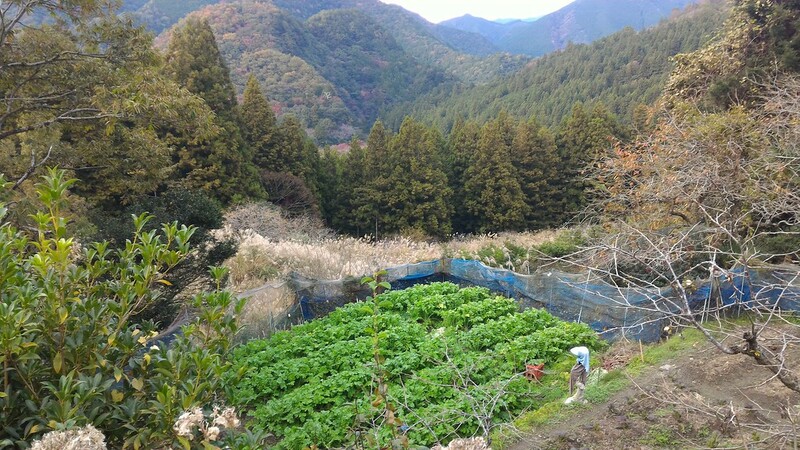 If you’d like to continue your adventure in the Kumano area, read on. 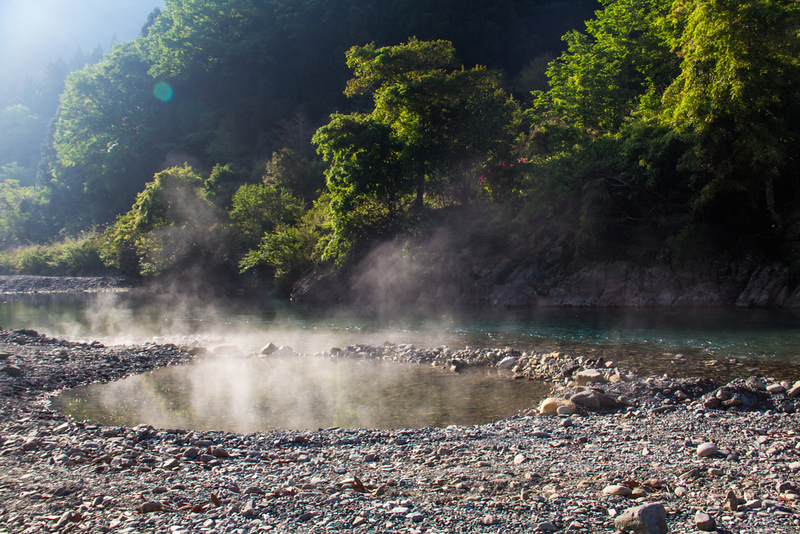 One of the highlights of Kumano are onsen (hot springs). Just a few kilometers southwest of Hongu is Yunomine Onsen, which is where many people stay on the third night of this trip. 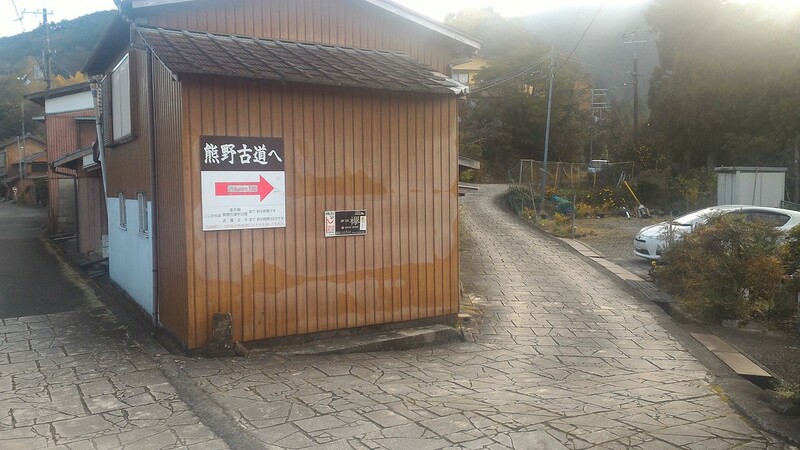 In addition to two great public onsen here, most accommodations have their own private onsen. 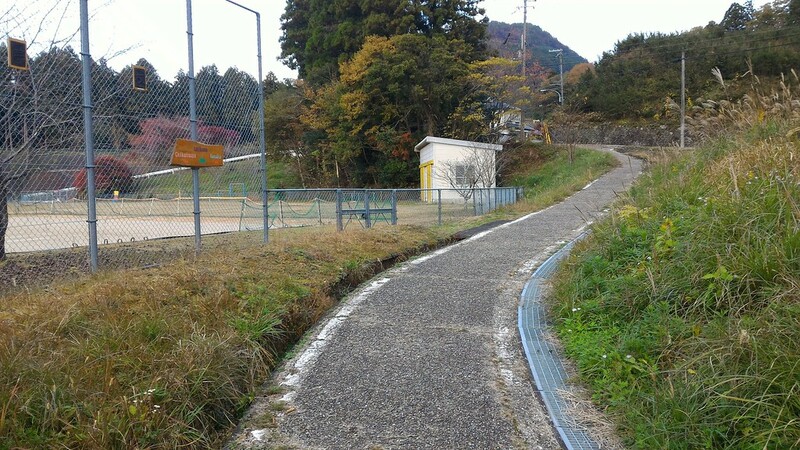 You can walk to Yunomine from Hongu or Hosshinmon-oji, but many people take the bus from Hongu. For some places to stay in the area, scroll down on this page. 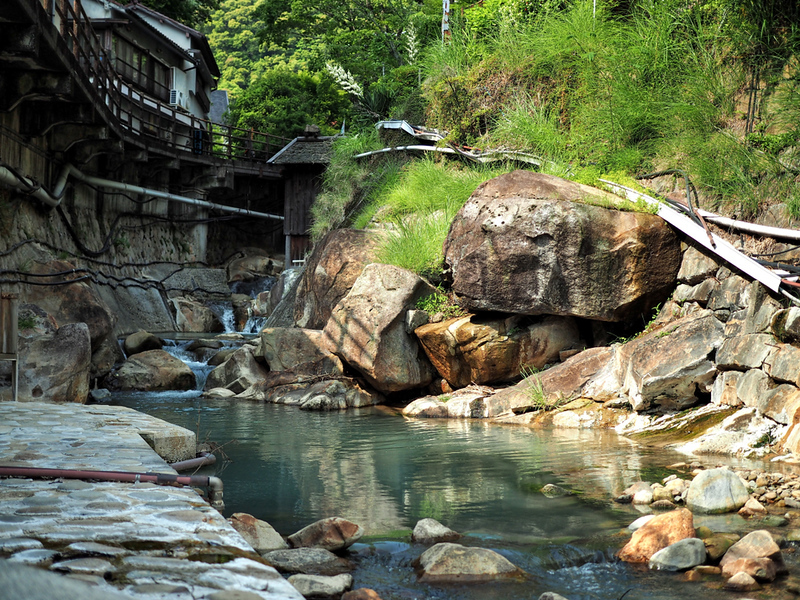 A few kilometers south of Hongu is Kawayu Onsen, which is a collection of riverside accommodations with private onsen. However, the real highlight here is the hot water that comes out of the river bottom. In the summer, it’s usually just one pool or two, but in the winter, they dam the river to create a giant “Sen-nin buro” or 1,000-person onsen. Kawayu is also accessible by bus from Hongu. 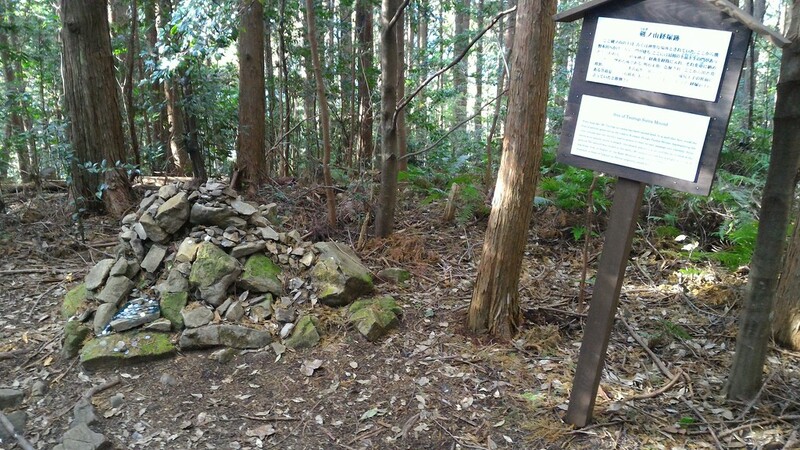 If you’d like to keep trekking, you can walk for two more days along the Nakahechi section of the Kumano Kodo to reach Kumano Nachi Taisha. From there, you can bus it out to Shingu, on the coast, where you can catch trains back to Osaka and onward. 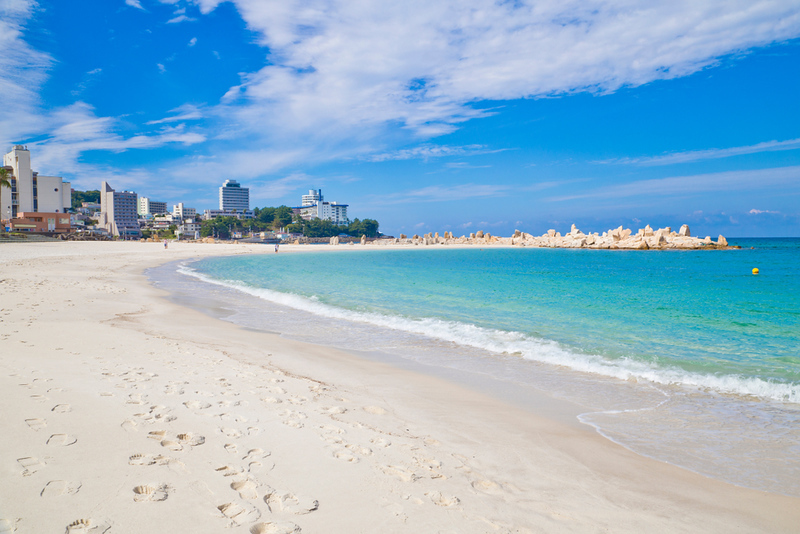 If you like beaches, in warm months (May to October) you can go to the beach resort of Shirahama, which has both great onsen and a nice stretch of white sand beach. This is awesome in September when the water is still warm but the crowds have gone home. 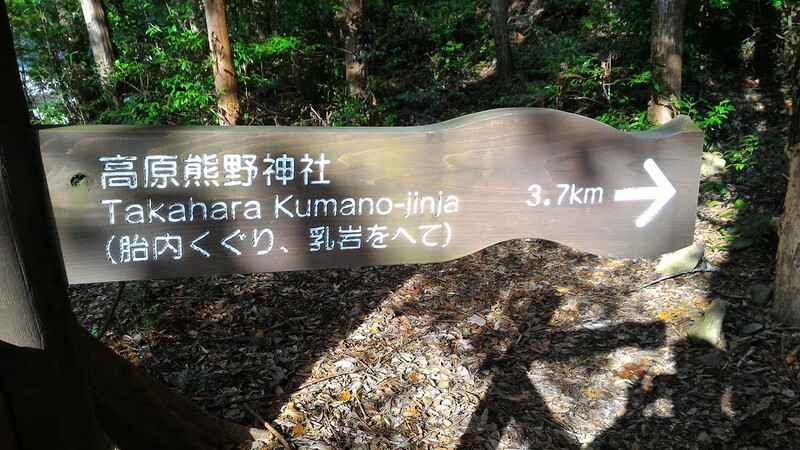 To do this, take a bus from Hongu back to Kii-Katsura and then hop of the train for the short ride south to Shirahama. Getting back from Hongu to the cities up north is easy. First, catch a bus from Hongu to Kii-Tanabe, and then reverse the route you took to get down here: Kuroshio Express north to Shin-Osaka and then shinkansen onward from there. As I wrote above, if you get to Hongu before around 3pm on the third day of the hike, you have time to catch trains north to Osaka or even onward. Since you can stay in guesthouses on the route, you don’t have to carry backpacking gear. Bring warm gear in colder months. Bring a sun hat in warmer months. Carry one outfit in a dry bag or plastic bag to keep it dry and clean to wear in the guesthouses in evenings and on the bus/train on the way north. Buy trail snacks in convenience stores or supermarkets in Kyoto or Osaka before heading south. The selection in Kii-Tanabe is pretty limited (at least near the station).